An online journal documenting the planning and building process of our modern home from start to finish. It is intended to share our experiences throughout this project with all those interested in modern design. Did a quick weekend trip last weekend with a plan to meet Rich Halverson from Halverson Plumbing out of Black River Falls. 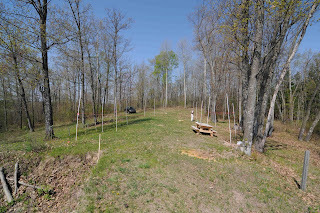 We set this up right after our summer trip as the septic location needed to be determined in order to complete the house final location and all the other utilities. Septic System: We ended up leaving Friday morning out of San Diego to Minneapolis and flew back Monday afternoon. We met with Rich right on time on Saturday morning. After walking the site, we were happy to hear that Rich thought the location we preferred had a good chance of working for us. It was really nice for Rich to come out on a Saturday to pre-meet us before Monday morning's plan to meet the County! Bright and early on Monday morning, we got up at 5 am (3 am PST!) to make it out to the property to see the sunrise. We ended up getting there right after 7 am and made the final corner at the top of the hill right when the sun was starting to rise. The valley was foggy and super-cool! We heard Rich down the hill unloading the trackhoe right on time at 7:30. Rich ended up digging around eight holes to get the lay of the land. The inspector from the Jackson County zoning/planning department, came out and inspected the holes and confirmed that the amount of usable soil was just deep enough for an in-ground septic system - we were so happy! After confirmation from the County, Rich figured out which holes worked best, and came up with a concept on how to lay it out. He got out a laser level, set up some contour lines on the ground, and managed to set out three leach fields fourteen feet from field to field, that will probably not require cutting down any trees. How awesome it that! Not only will an in-ground system work, but it will be out of site from the house. What a relief! Fall Colors: Can you say perfect timing on the trip, too? I think we spent the nicest three days of the year on our property. 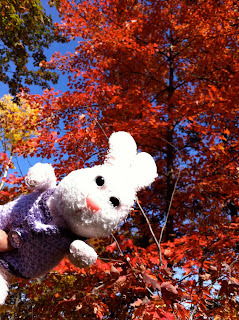 The trees were at peak color and the maple trees on our property were some of the most awesome trees I have ever seen! 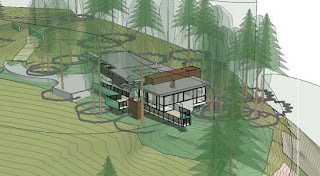 So awesome that we have considered some ideas on slight changes to the house design because of it. We will see what the details of Plan E look like and see if any changes make sense and talk to Jim about it. It was interesting that on Monday morning, many of the trees had lost half their leaves. The change happens so quickly! It was nice to just be out there and as the breeze kicked up, you can see and hear the leaves gently falling to the ground. It was nice to also see Joe's dad and Terese, too. They came up on Saturday morning and spent the day on the property with us then we (Joe/Terese, Mom/Dad Thompson, and all of Anne's siblings) all went to supper at the Stone's Throw in Hatfield. Another Trip Back and Plan E? Flew back to Chicago/Wisconsin in late July to celebrate Joe’s little brother, Jon, graduating from High School. This gave us an opportunity to visit the property again. We made arrangements with an electrician/solar power installer, a geothermal heating contractor, the electric utility provider, and last but not least, Jim! Day #1 (Tuesday) - Electric/Solar: Met with Eric Pipkin from Pipkin Electric. Eric is a super-nice, down to earth guy that was very knowledgeable with solar installation. Discussed placement of the solar panels, including the possibility of mounting a panel on the ground. After walking the site, it seems like the best place is still on the garage roof provided a few trees are removed. We had some ideas on bringing the electricity from the overhead power lines that run along HWY 54, including trenching up the road, trenching up the valley, or maybe running overhead to the top of the hill and then trenching to the panel. Since Eric is an electrician, we asked his suggestions on the matter. He helped us understand that in Jackson County, the utility provider does the installation work, including any work up to the panel at your home. In California and Arizona, Joe and I are used to having to do that work with approved contractors first, then having the utility come in and inspect the work, and then hook up the electric from wherever their main line is located. Day #2 (Wednesday) – Site work: Today, we (I should say Joe) worked on the site – primarily working on more tree trimming/weed removal. Joe did an awesome job trimming up the slope so some younger trees, including oaks, poplars, choke cherries, and pines, can now thrive! My sister, Karen, came out and hung out with us, too. 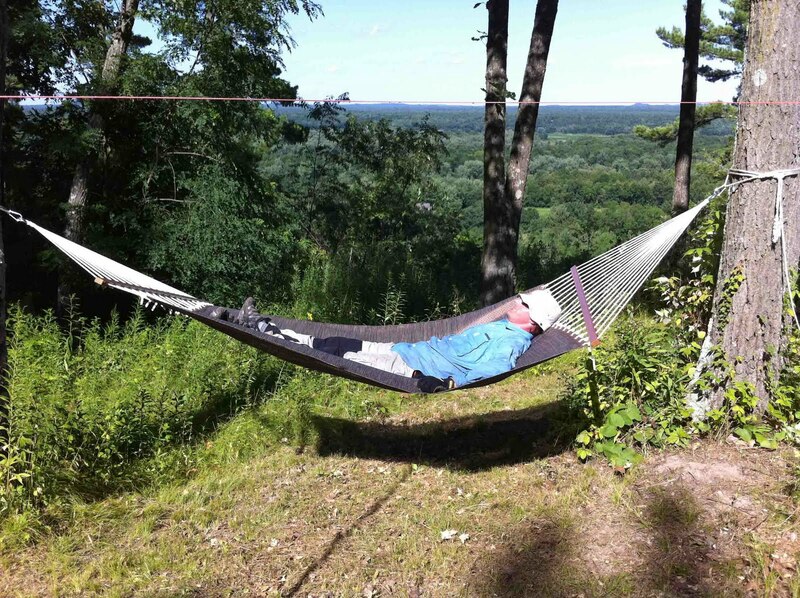 We also hung a hammock between a few trees. The doggies had a great time running around and hanging out! Day #3 (Thursday) – Geothermal: Met with Dan Green from Water Source Heating & Cooling, Inc. out of Eau Claire, WI. The day started off rough as it was rainy out. We made our usual stop for breakfast at McDonalds and headed out to the property. We drove up top while we waited for Dan to arrive. We decided to head back down the hill to wait for him as 10 am arrived, in the meantime it had started to rain. We met Dan at the bottom of the hill and jumped in his truck to head up the hill. Unfortunately, we got stuck at the low point right where the road goes past the pond. His truck was a bit heavier than ours and the rain had formed a greasy mess as it mixed with the clayey topsoil. About an hour later, we got towed out and officially started our visit. 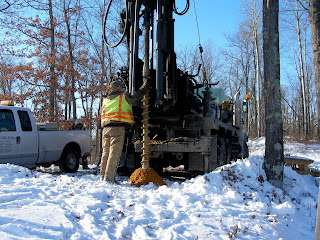 After walking up to the top of the hill and going over the layout, Dan recommended going with a system of four (4) vertical wells, each about 150’ to 200' deep. Putting the wells in to the north and/or east of the proposed house location seemed like the best location, but locating the septic system would need to be worked out, first, then all the other utilities would be laid out around the septic location. Dan went over some of the projects their company had worked on in the area and made us feel comfortable that it was a good idea, especially considering the incentives offered by both the Federal Government and the local utility, Jackson Electric. Dan strongly recommended in-floor heating, which we had planned on from the beginning. On the cooling side of things, Dan recommended a traditional air conditioning system. This is something we are not sure of. We'd like to forego air conditioning and place windows in the right places that passive venting and the overall placement of the house/windows/shading will keep things cool enough. We learned that creating zones is a pretty easy thing to do and should help keep costs down, especially when we are only using a portion of the house. Dan also echoed what Eric had told us about as far as the utility putting in the electric to a site. Dan called his contact at Jackson Electric and was able to get them to schedule a site visit with us on Friday, which was awesome! Day #4 (Friday) – Electric & Architect: Met with Dan McKevitt with Jackson Electric Cooperative. Dan is an old family friend and it was neat to see him again after such a long time! Dan is a little older than I am. He was a great athlete and I remember going to basketball games with Dad to watch him play when I was in Junior High. We were so thankful that Dan rearranged his day to meet with us on such short notice. I had talked to him on Thursday to arrange the timing, but I don’t think he made the connection that I was Anne “Thompson” – Al and Laura’s daughter from Merrillan. When we met him at the office, it all made sense. After meeting at the office, we made a plan to meet Dan at the site in about an hour, so we stopped at McDonalds and then headed out to the site. Not wanting to get the car stuck, we walked up the hill to check out conditions. We thought Dan might be on the way, so we started walking back down and met him halfway up the hill. We had a great time talking with Dan. We explored all the possible ways to bring in electricity. Dan indicated we could possibly use the electric pole and use an overhead line, provided the span is not more than 300’. He went over the costs, timing, process, and rebates offered by Jackson Electric. Dan planned to come back and inspect the site again in fall after the leaves fall off the trees to assess the options of trenching up the valley and overhead power. We sent a map of the three options to Dan for him to use in his assessment/cost estimate. Jim had a few questions for us that he came up with after thinking about the design over the last few months. First question was the deck. After talking for a short while, we decided to eliminate the deck to the south and keep the one to the east. Another question was the arrival. The last time Joe and I were there, we took some PVC pipes and laid out the corners of the garage and the house. If you look closely you can see the PVC, as well as the pink string we used to mark the first floor/lower level elevation. This helped to “see” the arrival as we walked up the access road. After walking all around the entry area, we all agreed to flip the garage 90 degrees so that the garage doors face west instead of south. 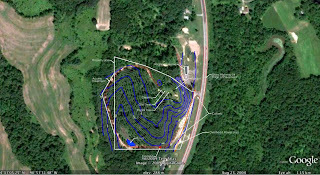 Also, we decided to send the access road in through the trees just before you get to the top of the hill instead of dropping in elevation and around the clump of trees. Doing this maintains the east-west axis of the house and really accentuates the view as you arrive. It also places the garage further away from the trees to the south of the house, making the solar opportunity better – we may be able to get away with cutting fewer trees. This was a big change that really made so much sense. Right when we were standing there, we all were like – Yeah – that is perfect and how it should be! At that moment, the sun broke through the clouds and we all experienced a “Jesus” moment. After sitting back at the picnic table, Jim sketched up the changes and we ended up simplifying the design a bit as far as the lines in the house. The garage mass is now reflected in the dining room mass with a backbone of the kitchen/entry walkway connecting the two. The garage shift also created an outdoor area with three sides that creates a cool, sheltered area for the doggies. Can’t wait to see the new plans, dare I say Plan E for Ennesser? This time we really feel like this is it…we are so excited! Mom stopped by as we were finishing up with Jim. It had been dry for awhile, so Joe went down to drive her up the hill. Unfortunately, the truck that got stuck yesterday created ruts and the road hadn't dried out enough and the allroad got stuck by the pond, too. I rained really hard Friday night and made things worse...what are the chances of that!?! Day #5 (Saturday) – Travel day: Got up early and Dad, Joe, and I went out to the property to get the allroad unstuck. Joe put the snow chains on and Dad hooked up a chain and we pulled it out. When we inspected the area, it looks like the level of the water was almost over the top of the road. We will need to consider how to design the area by the pond to ensure the road never gets washed out. We can put in a culvert to drain the pond and build up the road, make sure the road is compacted well, and add some rock/grouted rip rap. We can always attach a standpipe with a drain at the top to keep the water level at a constant elevation in the case of high water, too. Decided to start driving the long road back to California Saturday afternoon. On the way out of town, walked up the hill again for one last look, even though it was hot and humid. We will sure miss it! Next steps are to plan the summer of 2011. Hopefully we can determine the septic location/design, get the road graded to drain with a nice base laid down, get the electric up to the site, and drain the pond by placing a culvert under the road. It was great meeting the local contractors. It is so refreshing to meet good people that you really feel know their trade and can be trusted. A completely different feeling than you get in California. We are really looking forward to a great experience! 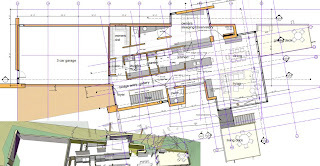 Plan B - long, going out towards the cliff but then turned back on itself with bedrooms on backside of house; 2 floors. This change was necessary after the results of the geotechnical engineering study showed we needed to stay 50ft back from the cliff. 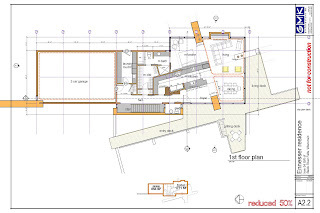 Plan C - 3 floors w/ master bedroom on top which had a south facing angled huge skylight above the bed. 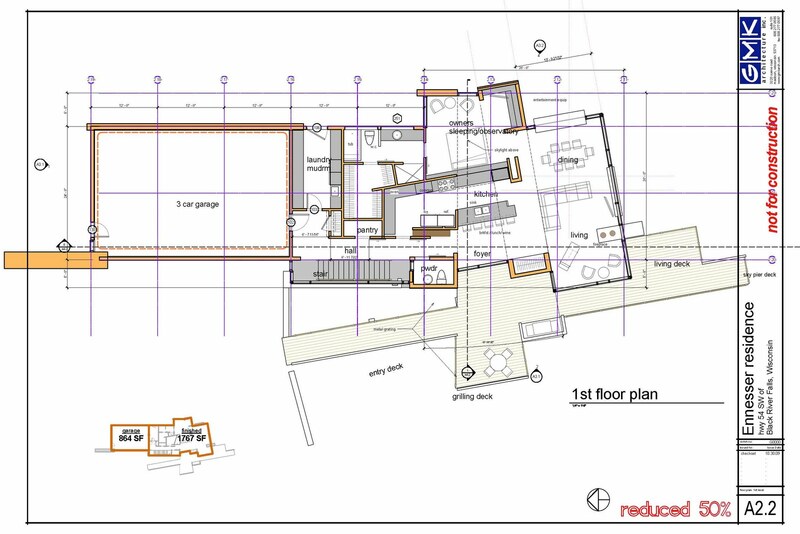 Plan D - the current one - a 2 floor version of B with a skylight like C which will run from just over our bed, south over the kitchen. The master bedroom is set up so that it is open into the kitchen and living room so the view from all the windows in the living room and bedroom can be shared, as it was in Plan B with a large pocket door and a pocket wall that we can move into place for privacy when guests are over; however, the pocket wall's orientation has moved from north-south to east-west. Most of the living/dining/kitchen area is going to be floor-to-ceiling windows looking out towards the cliff. The master bedroom window looks west out into a beautiful stand of poplar trees. Heating/Cooling - no forced air (i.e. duct work). 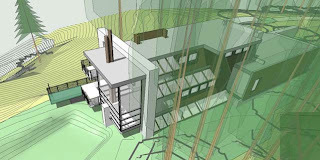 We'll have radiant heat in the floors and use a geothermal well system to heat and cool the house. Anne is working out the early details of the geothermal system. We will be on a well for water, we'll be drilling that anyway. Photovoltaic system - we had an assessment for solar energy potential done by a local consultant, Pipkin Electric, Inc. It looks like solar will work great and we now need to determine how many panels we will need. Electricity/Phone - need to figure out what is the best way to get it up to the top of the hill. Our access road is 1/2 mile from the paved road (and power) to the house site. It's not feasible to trench up the road, so we need to figure out how to go up the side of the hill. I think we will also have a back-up generator in case. Since our power will be coming down the road from a long single run either way on the highway, in the event that there is a big storm/ice storm, a generator would be a good idea. We plan to meet with Eric from Pipkin Electric to go over the constructable possibilities. Septic System - not really happy about this, but here is no sewer system in this area so we'll need a septic field or large holding tank. We don't have much flat land at the top of the hill, so the latter is probably the only choice we have. We've set a goal to start construction in April/May 2012 to give us time to finish working out these details and hopefully to have it completed by December in 2012, just in time for the end of the world! Overall, we both like the Living/Dining Room switch, but are not completely sold on the skylight. We are planning a trip home soon to lay out the house on the land and see if that can help us identify which solution to develop. Can't wait to visit the site again! Really, this is Plan C of location #3...between the mill concept and the HWY 54 property, we were trying to negotiate to purchase eleven acres of land near Merrillan. I might go back and post that small chapter in the Our Modern Home book so if anyone is out there, they will get the full story. My best friend, Angela, LOVES Plan C. Others that I have shown Plan C like it better, too. I can see where most other people wouldn't like their bedroom to be so "exposed", but Joe and I are good with it. After thinking about it for over a month, both Joe and I landed on developing Plan B as the design concept. We like the simplicity of it, and it should be cheaper as it is smaller. I'm not sure if it truly is, but Plan B also seems less complicated. Next plan is to go home in April and set some stakes down on the ground to see where it will sit on the land. I am going armed with the sun/moon angles for the year to see if any rotation of the house would be a good idea, too. I can't wait!!! Sometimes, Plan B ends up being better than the original plan and that is what Joe and I believe about the second design concept for our home. After review of the Geotechnical report and recommendations, we decided to pull the home footprint back away from the edge of the slope. Building the original concept could be done, but we weren't willing to pay for the more expensive foundation, so we explored new ideas (this way, we will have more money for windows, anyway!). We are both very excited about this one and can't wait to see how the final design unfolds! After having time to review the geotechnical report, we scheduled a conference call with our architect , Jim, on January 8th. Jim talked to the geotechnical engineer and a structural engineer that he works with frequently. Based on the implications of the stability analysis, Jim had a new concept for the home which moves the footprint back away from the cliff to avoid a complicated/expensive foundation. 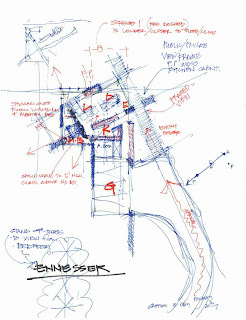 Here is a cool sketch of the new concept that Jim sent over. We went over the sketch together in our conference call. At first, Joe and I were bummed about the news, but the more we looked at the new concept, the more we liked it. By the end of the call, we were ready to give up on the diving board and look into the new concept full steam. 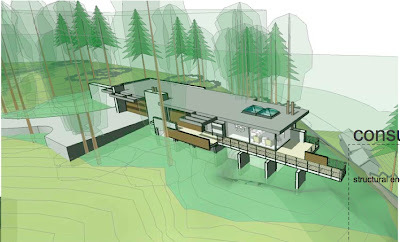 Instead of a long, narrow "shotgun" style house, this new concept turns the portion of the house that was near the cliff back on the house itself at an interesting angle. The result is the master bedroom now has a cool view of the poplar trees. Also, incorporated is an entry bridge that is detached from the house, connecting the driveway and the front door. Very cool! 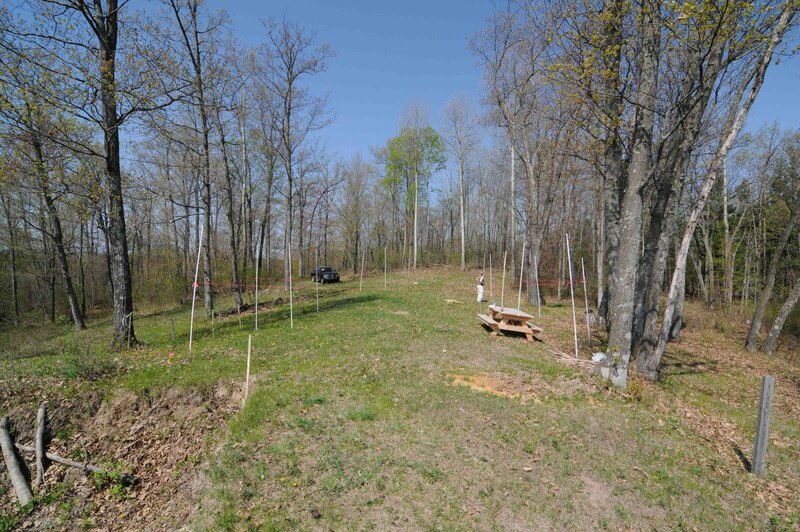 Recommendation is to remove the topsoil, clay, and silt and to anchor the foundation into the sandstone in areas closer to 50' from the top of the slope. Looks like we can build the house, the question is what kind of foundation will be needed. In November, the architect asked about the subsurface condition to ensure where the house could be placed (how far away from the top of the slope) and to determine an appropriate foundation design. After asking my sister, Karen (who is a structural engineering that works on bridges out of Eau Claire, WI) what geotechnical engineering firms were located in the area that she would recommend, we contacted a few consultants. After receiving a nicely summarized proposal and having a good conversation with one of the geotechnical engineers, we decided to hire Chosen Valley Testing to do the subsurface investigation and slope stability analysis. We scheduled the drilling for December 11 and I got some plane tickets to come home for a long weekend to watch the drilling and meet the geotechnical engineer at the site. In the week leading up to the drilling, we kept checking the weather report as snow storms and bitterly cold temperatures were forecast. On December 8 and 9, the area received over a foot of snow! My Dad hired a guy to plow the dirt access road to make sure the drill rig could make it up the hill. The plowing was to take place the day before the drilling, on the tenth. I was also flying that same day, with my flight leaving on the morning of December 10. On the way to the airport, I talked to the geotechnical engineer, Jay, and he confirmed that it wasn’t too cold to drill and as long as the road was plowed, the rig should make it up the hill. I arrived at my Mom and Dad’s place at 11:45 pm. It was -9° F. When I got in the house, I discovered my Dad wasn’t there. He had gone back out to the site to help the guy plowing the road because he blew out a hydraulic line on his bobcat and his truck had gotten stuck in the hole at the very top of the hill. Long story short, the guy worked on plowing the road from 1:30 pm to past midnight. 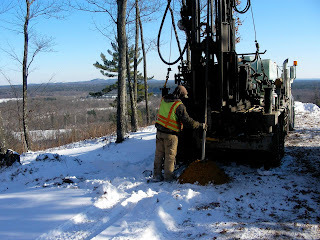 The next morning, the drillers showed up, put on chains, and made it up the hill no problem. That was a big relief! I think my Dad was convinced the rig wouldn’t make it. It ended up being a beautiful day. It was 5-10° the next day, but fortunately there was hardly any wind. We drilled three holes along the conceptual placement of the home. Under the topsoil, there was around two feet of dark gray clay, then around two feet of dark gray silt, then around four to ten feet of orange/yellow fine grained sand, then yellow/white sandstone. Jay said the stone looked pretty strong and his preliminary assessment was as long as the clay was removed, which we would do anyway, it should be OK. I was sure happy to hear that! 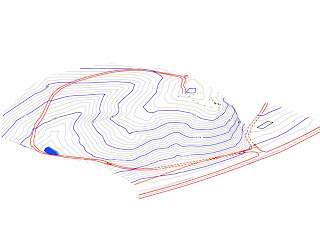 A couple weeks ago, Jim sent us a few aerial and elevation views of the topo data that Anne generated from our survey. It was neat to see all the work we did in the survey turned into a 3-D map but we were unready to get this (below) so soon. Jim has been working on the design and sent us a few early images of what the house will look like. This is just too cool! It was really awesome to see what we had talked about just a few weeks ago take on a physical view and to see it on our site - WOW! Anne and I have spent a lot of time (years) looking through various magazines and websites (Dwell, Innovative Home, Architectural Record, etc.) 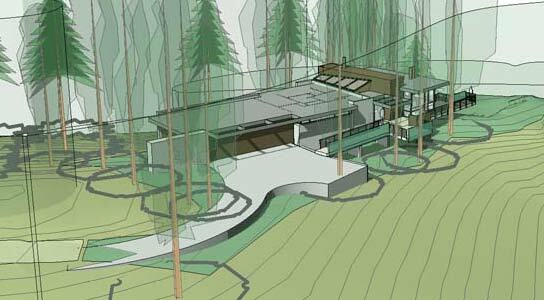 and a lot of time talking about exactly how we envisioned our future home would look and fit into our property. Basically, it was going to be a "boxy" two story structure, perched along the edge of the overlook with our bedroom being the only part of the upper floor to maximize the views (but this was all going to change by the end of the day). Basically a bunch of stacked boxes with lots of windows. It was a pretty cold morning and it had actually snowed overnight, although for the most part it didn't stick and today was the day we were meeting Jim out at our property for the first time. Even though it was cold, it still was particularly nice since the leaves in all the trees were in their autumn colors. This site really is just amazing and when you first get there you just have to spend a few minutes taking it all in - pictures just don't do it justice. We spent some time and walked around our entire property talking some more about what we wanted (or maybe didn't even know we wanted) from our home. We went back up to the top and between walking around the clearing and sitting at the picnic bench, Jim started sketching out some ideas. His initial suggestions revolved around not having the master bedroom on a second floor but rather as part of the main floor ("why go upstairs to go to bed? he kept saying) where the kitchen and living room would be then have a lower level containing other bedrooms, exercise room, etc. We were still pretty sure we wanted it located along the overlook out near the edge of the clearing. He then started talking about and drawing out what the structure itself might look like. After a couple iterations, he threw out this idea, that it could look like a bridge/train trestle - an elongated structure sitting on top of several repeating concrete walls or piers. These piers would make up the lower level of the home with rooms built in between each of the piers. 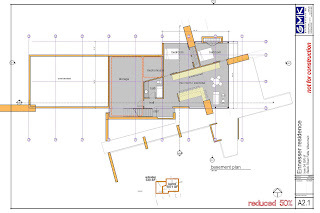 This lower floor would be built partially underground. This was an idea Anne and I both really liked a lot. Then Jim suggested that there could be a walkway deck running along one side that continued out past the house almost like a pier or dock out over the drop off. This got us really excited, but we still had the house right in the middle of the clearing - it was then that we realized what really was the best part of the property. It's not just the sweeping view of the horizon from the overlook, it is the experience of getting there. In coming up "driveway" to the top of the hill, you round a corner and there is a WOW! moment as the sweeping view of the horizon comes into view. The picture included here is what you see and there is a short video clip of driving up HERE - sorry for the bad cinematography (if you would even call it that, but I think you get the idea). At first you think, the middle of the clearing would be a great place to build a home, but obviously putting it there would take away that wow factor as you arrive. It was then that we decided to place the house along the line of view so the walkway and "sky pier" would guide your eyes out towards the horizon and to push the house as far to the left field of view as possible, almost so it wasn't blocking the view at all. At this point, it seemed like nothing else could be a better design for this site and for our home - an elongated bridge-like structure with a sky pier extending out towards the horizon. Cool! 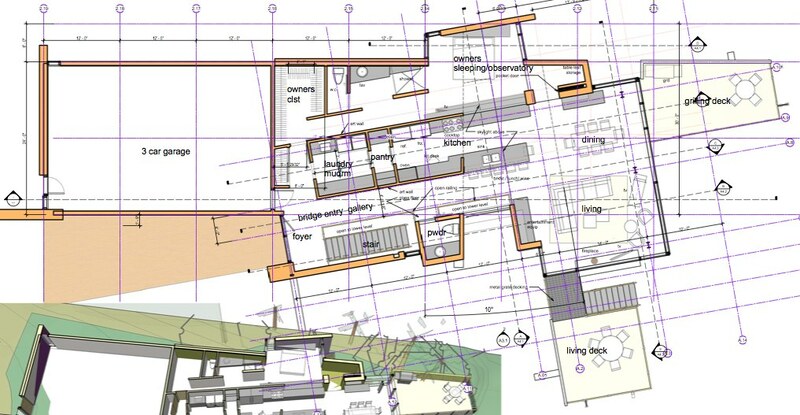 To get going on the design, Jim would need the topo data from our survey and some information on zoning and construction requirements. Anne has already put a lot of time and research into this so we have a good start but we'll need to work on getting a geotechnical analysis done to determine the stability/bearing capacity of the soil. Also, we'll have the contract details to work out with GMK Architecture which we can do over the next few days. It's funny how we started today out being so sure that we "knew" exactly what we wanted and having in our mind what w thought that looked like but left today with something somewhat different and really feeling that the elongated bridge-like structure concept is really what "should' have been built here all along. Both of us are really excited to see where it's going to go! We drove down to Madison yesterday to meet Jim Gempeler the residential design architect at GMK Architecture. We actually met Jim a few years ago when we were trying to plan our earlier (but failed) project at the Merrillan Mill site (see earliest posts). We had approached him to design our home there and besides having some great ideas, the first time we met at his office, we ate bratwursts they were barbecuing out back and ruffles potato chips for lunch. I think the brats sealed the deal for Anne. We showed Jim the topo survey map that Anne made, pictures, and video of the site and talked about what we "envisioned" being built there. We also talked about the design materials that we would like to see (exposed concrete, steel, and glass) and things we didn't like so much (curved walls, angled rooms). The whole time, Jim was really excited enthusiastic and you could get the sense that he is passionate about his work and really wanted to design a house that fit us and our lifestyle. Something about the whole situation just felt right and there was a certain calmness about it. He threw out many great ideas but really wanted to take a trip to the site to see and discuss it first hand. Since we didn't have much time left in our trip and with winter approaching, we decided to meet there the following Tuesday morning. We left that day feeling even more excited and optimistic knowing that we were one step closer to finally making this a reality. We drove back to Merrillan and to top off an already great day, we went back out to the property after dark and watched the Moon rise over our view of the eastern horizon. It was awesome to think about how many more rising moons we would see in the coming years when we live here! We just arrived driving from Riverside, CA to our property in Wisconsin. We drove here to meet with an architect in Madison, WI to possibly begin the design of our home. Orion and Astro drove with us and they traveled really well. The majority of the way, you wouldn't even know there were two dogs with us. We drove from Riverside to Cedar City, UT on Tuesday night, then to Lincoln, NE via Denver. The drive through the Rockies was awesome - we caught it just in time to see the autumn colors at their peak and even a few inches of snow covering the tops of the mountains from the night before. We even hit a cool hail and lightning storm in the dark just as we were crossing from Colorado into Nebraska. The rest of the drive took us through Iowa, then Minnesota, and into Wisconsin via La Crosse. From here it is 37 miles to our property - considering that I might end up working in La Crosse, it's not a bad drive. We arrived at our property just before sunset. Going up our driveway (1/2 mile from the road), the trees all around were in full autumn colors and it was like driving through a tunnel of bright golds, oranges, and reds. As you near the top, the view opens to overlook the Black River and the view was amazing! (the picture is looking east over the cliff/drop-off). Maps at last! I've made three maps to show some of the details of the property that we obtained from our survey back in July. The first map is a basic map showing the contours and other data we obtained (roads, pond, clearing, trees, utilities, culvert, etc.). As Joe stated, after spending four days walking up and down and all around (especially Joe because he was on the rod the entire time!) 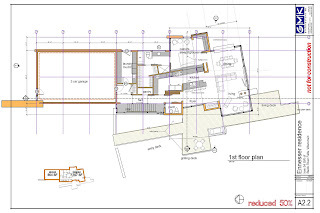 we really have a good idea of the lay of every inch of the place and how it fits in with the surrounding area. Here is the second map. It is the same as the first, but I've added the Google earth image to the contours so you can see how the contours relate to what is actually on the ground. You can really see the dirt road leading to the clearing at the top, Highway 54, and the neighbor's home with this view. It was so cool to have these features that we surveyed line up with the photo view! It is also neat to see the Black River to the east. There is also a neighbor directly to the south; however, there is no way you can see this property from the top - you can barely see it as you drive up the dirt road. One other interesting thing to note is at the very top. You can see a small patch of yellow where the greenery has been removed. The previous owner had a trailer parked at the very top. They dug a hole to place the trailer in and the vegetation has not grown back in as of the Google Earth 2004 photo. Here is the third map. 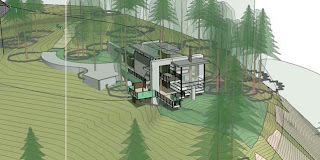 This is an isometric 3D view of the property looking to the WNW at the property. In this view, you get a feeling of what it looks like from closer to the road level looking towards the property and can see how the road wraps around the property and the sandstone cliff on the northwest of the property. 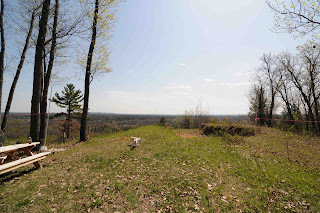 Bought and Surveyed a 14 acre wooded parcel in Wisconsin - its AWESOME!! Finally getting time to update the blog with our recent progress. Although it took a little longer than expected, we finally closed on the 14 acre piece of property in Wisconsin. It is located about 6 miles outside the town of Black River Falls. 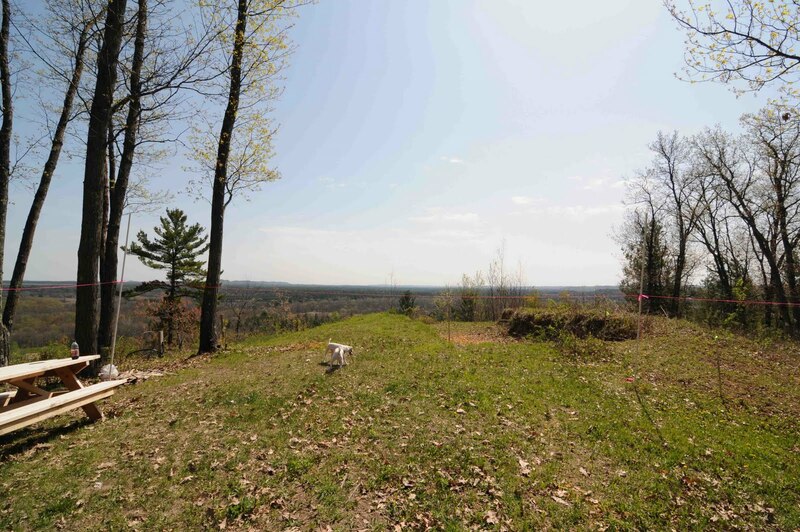 It is a beautiful vacant lot with a half-mile dirt road leading from the paved road below to the top of a 150ft tall cliff with clear views of the entire eastern horizon overlooking the Black River valley. We spent several days there in July clearing brush and surveying the property. It took about an entire day to to clear the fallen trees on the road and mow down the tall weeds that had grown up on the road and clearing at the top. Anne's dad and brother really worked hard to help us get it done. We then spent the next three days topo surveying the entire 14 acres from top to bottom. You would never know how exhausting it can be to survey such a small area until you do it. We were wiped out by the time we were done but there is no better way to get know your property than to walk up and down the entire thing. Besides the great clearing at the top (where we are going to put the house), there are some other really neat hills, valleys, clearings, and even a small pond here. As far as wildlife, we saw several deer and wild turkeys while surveying and even saw signs that there might be bears here (from the ripped up tree trunks). There were even a few eagles flying around below the cliff - very cool! Although the ticks were no where near as bad as when we first looked at the property, we did have a few on us by the time we were done. We are really excited to finally be moving forward again and it looks like the building restrictions are pretty minimal since it is an unincorporated area - we may even be able to put some small windmills up on the west side of the property since there seems to be a nice steady breeze on that side. Anne is working on the data from the survey now and preparing a topo map which we should be able to post a picture of soon. 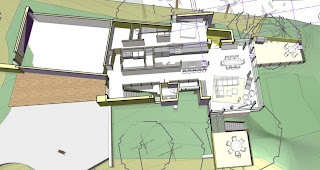 Then we will start putting together a "portfolio" of ideas and design elements we like to start taking to some architects so we can get a design going. Here is a map of where our property is. 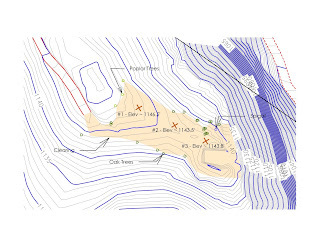 View the larger map and zoom all the way in to see a rough property line and the place where we are going to site the home. Anne spent several months searching for property listing and Google Earth for vacant land with some terrain and rolling hills. She really did put a lot of work into it and it finally paid off. We finally found a really neat piece of property for sale just south of the town of Black River Falls - just over 13 acres, with around a 100ft sandstone cliff that has a nice, flat, build-able area at the top. It has a great 180 degree view of the entire eastern horizon going about 5 to 15 miles off in the distance and somewhat to the south. 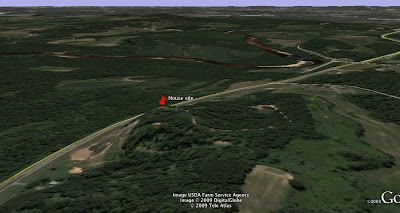 (see the Google Earth terrain model picture). Should be able to see some great moon and sun rises from there and should be good for utilizing passive solar "daylighting" heating. 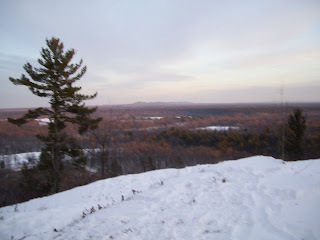 There is very little building below it (except for a house just at the bottom of the cliff and out of view) and the Black River is visible just to the east of the property. Pretty much everything in view east of the river is county forest land so will never be built on. There already is a dirt road in good condition going to the top which will make construction much easier and the big flat area at the top is more than enough to build a home on. Since it is unincorporated, we won't have any village board to deal with and since there is river/lake/creek on the property, the DNR won't be involved either wo-hoo!!. We put an offer in on the property, are in escrow now, and set to close on June 12th if all goes well. Overall, this is an awesome site and we are excited to finally start making some progress again! After some stones from the south wall of the Mill building foundation fell out and into the creek, the DNR decided to issue a "draw down" order to the Village for the lake behind the dam. They claimed it was a "high hazard" dam and the the stones falling out of the foundation of the building compromised the dam's safety. The funny thing is that just 12 miles away, there is a real dam with a hydroelectric plant, a big lake behind it, and substantial infrastructure below the dam. This dam actually is crumbling and needs to be repaired or removed (something being worked out by Jackson County and Black River Falls). The last time there was a major flood in 1993, a large part of the city was flooded damaging more than 100 homes (source here). Funny, this dam is rated as "low hazard". 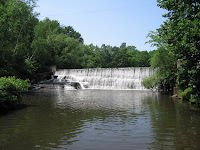 Compare this the the Merrillan dam which at most has around 10 acres of water in it and maybe 8 feet deep at the deepest part. Also, there are no homes/buildings in the flood plain area down river. Why would this dam be considered high hazard? Regardless, the Village Board was upset at the lake being drawn down which became even more of an eyesore. They didn't want to work with us to try to improve the situation and instead decided to try to first issue a "raze order" and then try to eminent domain the property from us. Amusingly, they really couldn't decide what to do, because at various times they were trying to eminent domain it from us and at others, they claimed that we really weren't the owners and the original sale to the first private owner was "illegal". Really, they had no basis for the eminent domain since having a lake isn't really a public necessity. We finally got tired of all of the trips and paperwork (and costs) to keep fighting and ended up selling the property to the Village in Jan 09. Which immediately afterward, they hired some local Amish people to tear down the wooden part of the Mill structure. The funny thing is, we can't figure out why they were so quick to tear down the wood since it really didn't accomplish anything. The DNR still won't lift the draw down order since nothing was done to address the "safety" concern and it is going to cost a lot of money to remove the foundation and engineer fill the site to a condition the DNR finds suitable something the Village really can't afford. We could have (on the other hand) afforded it, and would have added a beautiful structure to replace the delapidated Mill and also would have added quite a bit in property taxes to the Village's tax base in the process. In the end, no one benefited since the lake is still down, it is going to cost a bundle to fix it, and now there is a big, ugly, open hole in the ground next to the dam. So much for the public safety claims since the Village now does own the property (WITH A BIG OPEN HOLE) and has made no attempt to fence it in, or prevent someone from falling in to it (check out the video below). Hi everyone. I have been remiss in maintaining our blog. After the December Board of Appeals hearing, I was pretty upset and had a hard time getting going again on the project planning. In some respects, it seemed hopeless and hard to deal with being so far away. I’ve spent some time today in updating the blog to fill in the blanks on what has happened since December. Hopefully, the project can get some traction now and make forward progress. Over the last month, I have been working with the attorney to respond to the DNR to address their concerns with the building project. We were just about to approach them to go over the issues. So, my Dad called today. He left a voice mail message. He never hardly calls, and if he does, he doesn't leave voice mail messages. Not only is this a rarity, the message was 1 minute, 46 seconds long! When I saw that, I knew something was strange…I listened to his message to find that a portion of the south wall of the mill building had fallen into the creek. Granted, it was old, but since the Village was working on the Oakwood Lake drawdown project (see post on date), the “plug” on the dam has been pulled. There is (was) a tree growing out of the side of the mill building for a number of years now. The three foot diameter pipe that serves as the “plug” has been directing water directly at the side of the mill building and the tree since it was opened in January 2007. I think the vibration of the water for over the last year has finally helped the portion of the building just above where the tree is fail. We have talked to the Village President and let him know we will put up a new block wall inside of the existing block wall as soon as possible. So I finally did it. I never thought in my life I would have a real need to ever hire an attorney, but I do now! In addition to researching the Wisconsin State regulations to learn them for myself, I searched the internet for hours (from California) and asked for references from anyone I could think of to find an attorney in Wisconsin that specializes in land use, zoning, and municipal law. I figured if we were going to spend the money, we might as well go big and hire the best firm we could find. After talking to a few of the best around, we landed on a team of three attorneys from DeWitt, Ross, and Stevens. They came recommended by the architect we like. After talking with them, they confirmed what I was afraid of – if a judge heard the case, we would more than likely win, but all that would come of it is the judge ordering another hearing on the same issues, with the same Board of Appeals. The BOA members would still not be able to read a map or understand their Ordinances. If heard a second time, the BOA would have an attorney on hand, actually hold the meeting correctly, and come up with “valid” reasons for denying the variations. Unfortunately, we would be out a lot of cash and be right back were we started. The attorneys we hired had an alternative proposed game plan that we work with the DNR first, then go to the Village (if the DNR can work out an acceptable project with us). That sounded good to us, so we signed the agreement and sent in the retainer today. Today, the BOA finalized their official denial letter. During the December 18th appeal hearing, the BOA was advised they could consult with an attorney prior to making their decision, but they elected not to do so and made their decision right then, during the meeting. It is interesting that many of the reasons cited in the denial were not brought up in the appeal hearing. I was wondering how an attorney hired after the fact could come up with valid reasons for denial if they weren’t brought up at the meeting. In accordance with the Village Ordinance, the decision was to be filed immediately. The BOA elected to hold off on the official denial until they got it done with the attorney. The Ordinance states we would have 30 days from the decision to file an appeal with a Court of Record, if we believed the decision was not in order, but the Clerk said we would have 30 days from the date of the official denial to move forward with an appeal to a Court of Record. I’m sure that we would win, if a judge heard the case, and are gathering information to take the next step. The meeting minutes were finally done today. I have been asking for all kinds of information from the Village to see if it can help my case. The minutes are all over the place and some of the facts are off (and some are missing), but they are done, nonetheless. They can be found here, if you are interested. We Made The Front Page Again! The reporter from the local paper, the Banner Journal, attended the BOA appeals hearing and wrote up an article for the paper. Unfortunately, the way the meeting went can not be conveyed in an article like that. I just hope that going forward, we can help educate everyone on the facts of the project and get it ultimately approved. At this time, we are looking for attorneys to give us advice on how to proceed. The next step, per the Village Ordinance, is to take the decision to a Court of Record for a review. 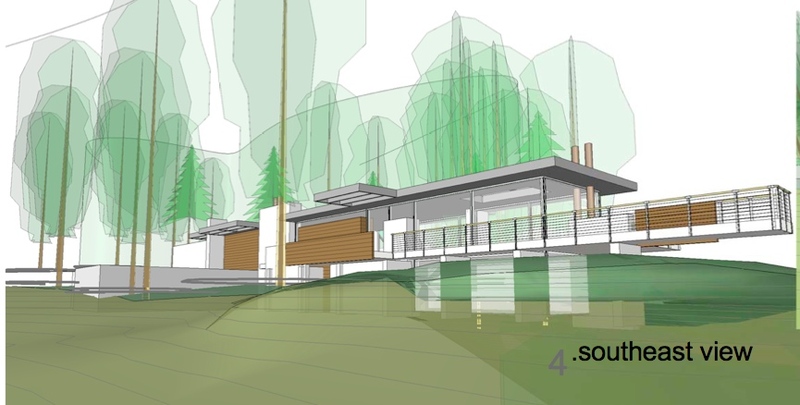 The first three were requested in order to build in the same location as the existing building; the last two were requested in order to build a green roof. The Village Clerk went over the five variations as listed in our application and turned the meeting over to me. I gave a PowerPoint presentation, similar to the last one I gave, only this time I concentrated on the reasons I was requesting the variations, and gave a list of community benefits including: strengthens dam embankment and foundation, provides example of green building techniques and construction/design methods, may improve utilities, improves the beauty of the area by replacing the deteriorating building with a beautiful structure, observatory will provide an educational resource for local schools, and continued use of property for residents to enjoy. 1) One of the BOA members was convinced we didn’t even own the property, even though an independent surveyor (hired by the Village) spoke and confirmed that we did! 2) Another BOA was concerned that our sewer connection would require disturbance of previously undisturbed earth. No matter how many ways I tried to explain that the sewer lines would run in the street/right of way in already disturbed areas, just like everyone else’s, he didn’t get it. 4) They kept saying the property was zoned Conservancy, but it is really zoned both Residential and Conservancy, and the entire project would be considered Residential pursuant to the Village Ordinance. Because they couldn’t read a map correctly, they kept getting this point wrong. 5) The County Supervisor attended and was not in favor of the project. He said that it wouldn’t be allowed if it was in the County and that if it was approved here, it would go before the County and they wouldn’t approve it (too bad everyone couldn’t understand that the rules that pertain to Village are different than the County and he is wrong that it would go to the County for a vote). 7) Of course, our friendly neighbor, “Swede” was there, speaking out against the project. On the good side, a few of the neighbors came and spoke in support of the project. But that didn’t matter. After the BOA heard that the DNR would potentially sue them and make them take out the dam, they didn’t really want or need to hear anything else. Without even questioning if the DNR even had the jurisdiction to do anything they were threatening to do, and without giving consideration for each of the variations individually and the reasons for them, in the end, the BOA members voted NO on the “project”. They didn’t give any reasons until I pressed them for reasons. The most vocal BOA member said beauty is in the eye of the beholder and with a flat roof, four sides – that's a trailer, a crackerbox, and we don't want a trailer there (the existing building has a flat roof on half of they building). Also, there were too many variances all at once and just because someone thinks they can build a house somewhere doesn't mean they can. He also mentioned it is zoned Conservancy (it isn’t! ), that there is no yard (there is more yard than most residential properties in town! ), and we would have to go on private property to wash our windows (the property borders Public property, not Private!). It was too late for me to address these issues, and he hadn't asked about these concerns he had during the public hearing to make an educated decision. One of the other BOA members said that she liked the building just the way it was (as if it was the Village’s building and a Village project), and didn’t want it to change. I said I didn’t hear any reasons pertaining to the three part test they were supposed to apply to grant or deny the variations and the Clerk said she’d come up with something out to it. After the meeting, they decided to hire an attorney to draft a response. The meeting was not conducted like a typical public meeting – there were no rules of order observed and even though it went on for over two hours, it went by in a flash. I wanted to say so much and have them understand so they could make an educated decision, but I wasn’t able to get the message across. Anne made the front page of the local County paper!! 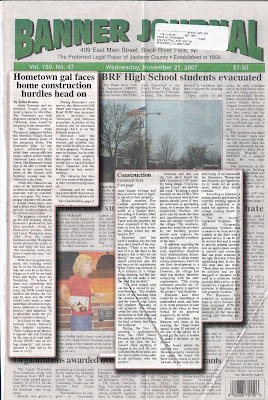 A reporter for the local County newspaper, the Banner Journal, was at Anne's presentation and wrote a really nice article (on the front page no less) about our project. It was written pretty much correctly except for the fact that I am a pharmacist and not an engineer. Earlier in November, Anne was back in Merrillan to give a presentation of our (intended) project to the Village Board. Although it wasn't tied to any formal decision regarding some of the legal matters needed to be made, it was really more informational. Many people had been talking about it (small town gossip) and we really wanted to clear the air and to show everyone just what our intentions were. Anne put together a PowerPoint presentation with some history of the Mill building and then went on to show what we had in mind for the structure that would replace it and how it would be designed. Overall, it went really well - people from the Village (except one, see previous post) seemed really positive about it and she got some good feedback. We both will be back in Wisconsin in mid-December to give another presentation to the Village Zoning Board of Appeals to who will decide on the fate of the variances that we will need to move forward. Here are the before and after mock-ups that I made for the presentation. On lucky 7-7-7, we made another trip back for Anne’s sister, Kathy’s wedding. The trip was a great chance to get some great pictures of the dam and mill building while the water on the lake is still down. You can see the two “plugs” on the dam – one is a three foot culvert running under the dam on the north side, the other is a concrete "box", approximately foot feet by six feet in area. During this trip, we had a great time, enjoying the weather (it actually rained!) and family, making the idea of moving back to the Midwest more real than ever. Since that trip, we have gotten serious with preliminary planning for the project. We’ve got a copy of the Village’s ordinances, along with the appropriate Zoning and Variance applications for our project. We also have the as-built locations for water and sewer in the vicinity of the site. 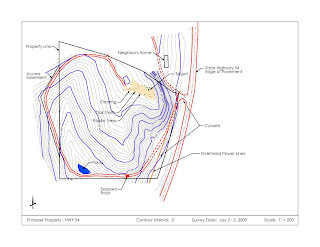 Both sets of survey data, along with the water and sewer information, have helped to develop a better site map (here). Anne has been busy researching and doing her own hydrology studies for the region. Anne’s sister, Karen, was also able to find some cool, old blueprints from the last time work was done on the dam in 1975 through the local engineering firm she works for. Soon we will be making our first submittals to get the project permitted – stay tuned!